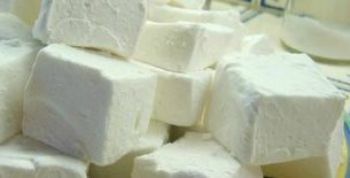 Homemade Marshmallows – just one of the many delicious recipes using gelatin. Granulated gelatin or powdered gelatin, gelatin sheets, or instant gelatin can be used interchangeably in your recipes. In order to achieve the correct results when preparing aspic or any other item that includes gelatin, you must be able to handle gelatin properly and incorporate it correctly. Gelatin comes in a granulated form when purchased from the grocery store or sheet form, called leaves, available from specialty stores. 1 (1/4-ounce packet) of granulated unsweetened gelatin = total of about 2 1/2 teaspoons. It is always best to measure the the amount of gelatin needed as the envelopes of gelatin can vary. 1 teaspoon granulated unsweetened gelatin = 2 sheets of leaf gelatin. Blooming gelatin is a step integral to ensuring the smooth texture of a finished product. It involves sprinkling the powdered gelatin into a liquid and letting it sit for 3 to 5 minutes. Then, when the mixture is heated, the gelatin will dissolve evenly. You can bloom gelatin in just about any liquid. Avoid the fresh juices of tropical fruits such as papaya, kiwi, mango, and pineapple as they contain an enzyme that will eat the gelatin. Pasteurizing kills the enzymes in these fruits, so canned or frozen juices are fine. Water Temperature: Boiling destroys gelatin’s ability to set. Sprinkle the gelatin powder evenly over a cool liquid (usually the liquid amount is specified in the recipe). Scattering or sprinkling the gelatin over the liquid’s surface prevents the gelatin from forming clumps. If the liquid is warm or hot, the gelatin cannot soften properly. For a clear, uniformly set mold, gelatin must be completely dissolved. Then add the remaining liquid needed for your recipe. Firmness of Gelatin: Firmness varies on the ration of water to gelatin and to temperature. Use 2 1/2 teaspoons or 1/4 ounce unflavored gelatin to 2 cups of water for standard firmness. Decrease or increase water for your particular needs (see chart above). One 3-ounce package of flavored, sweetened gelatin needs 2 cups of water. One tablespoon of unflavored powdered gelatin equals 4 sheets of leaf gelatin. Too much sugar can inhibit the gelatin from firming up – as the more sugar in the recipe, the softer the resultant gelatin will be. When using sugar with unflavored gelatin, mix together the sugar and gelatin before dissolving with the liquid. Adding Other Ingredients: To add to fruit, meat, and/or vegetables in gelatin, first chill the gelatin until it is the consistency of cold egg whites (but not set) before you mix in the additions that you want. If the gelatin is not thick enough, the fruits or vegetables may float or sink. Some fruits, such as pawpaw, pineapple, figs and kiwifruit, contain protein-splitting enzymes that prevent gelatin setting. These fruits need to be cooked before they can be set in gelatin. After adding the ingredients, then chill until completely set.Be sure to drain all solids of liquid before adding to gelatin so you will avoid watering it down. Layer Gelatin Flavors: Chill each layer until set, but not firm, before adding the next layer. If the first layer is too firm, the layers may slip apart when unmolded. Many layers may be built up in this way. Except for the first layer, the gelatin mixtures should be cool and slightly thickened before being poured into mold. If mixture is warm, it may soften the layer beneath and they may run or mix together. Whipped Gelatin: One of the easiest things you can do to change the texture and appearance of Jell-O Gelatin is to whip it until thick and fluffy. First prepare and chill the gelatin until very thick. Then beat with rotary beater or electric mixer until mixture is fluffy, thick. and double in volume. Refrigeration: Keep all gelatin dishes refrigerated until ready to serve to maintain their gelatinous state. Store gelatin desserts in a covered container to avoid the formation of a thick rubbery skin on the surface. Allow gelatin to set until completely firm, several hours or overnight. Before unmolding, dip knife in warm water and run knife around edge of gelatin to loosen. Dip mold in warm water, just to rim, for 10 seconds. Lift from water and gently pull gelatin from edge of mold with moist fingers. Place moistened serving plate on top of mold. Gently remove mold. Hello, every time I find a recipe for chocolate or white chocolate mousse it always asks for gelatin. We are vegetarians and would prefer a substitution or any other suggestions! Thanks for a great website! Agar – (know as agar-agar and kanten depending on the source) is a vegetarian gelatin. It is a whitish color, and comes in either sticks, flakes, granules, or powder, usually in a little packet. Most health food stores seem to carry it in with the Japanese foodstuffs, or along with the more familiar seaweeds (dulse, kalp, wakame, etc.). 2 tablespoons of flaked agar to 3.5 cups of liquid. The granulated form is twice as strong as the flaked; the powdered is three times as strong. Play around with the concentrations to get the right ‘wiggliness’ for you, since too much produces some real textures. Yes, you can add dry jello to cookie dough. The recipes says to sprinkle gelatin over water then dissolve over hot water. Does this mean you put bowl over a saucepan of hot water? Many years ago I found a cook from scratch fudge recipe that used a small amount of gelatin. No marshmallow etc, just old fashioned fudge. It always turned out creamy and totally wonderful. I did an extensive search and did not find anything. Can you help me please? Here is one called Gramma’s Gelatin Fudge. I have not tried the recipe. I am trying to make a chocolate “cake” with an orange curd centre which will run freely when the cake is cut. Can I use gelatin to make a barrier/restrainer to contain the orange curd until it is cooked in the cake? Will the gelatin dissolve properly in the heated cake mixture? Hi, when you sprinkle it over cool liquid, do you stir it in or just let it do its thing? What if I accidentally warmed it before letting it sit for 3-5 minutes? Do I have to start over?